See what cat litter brands rate the best on Viewpoints. Cat owners know how persnickety their feline friends can be about, well, everything. But there are two things that cats are extremely picky about: litter and food. Ensuring you have the optimal litter for both your home and your kitty’s needs can be extremely important. Especially if you don’t like cleaning up unwanted messes behind your favorite chair. Viewpoints reviewers agree that there are three key features of cat litter that will keep both owners and pets happy: dust, odor and clumping quality. Buying a cheaper brand of litter may be enticing, but our reviewers warn that these inexpensive brands produce dust, allow unwanted odors and do not clump well. 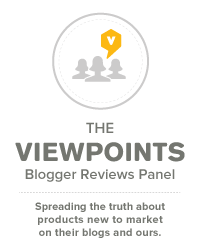 Check out the biggest issues for Viewpoints reviewers. 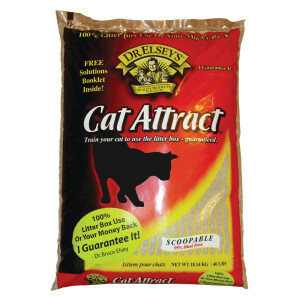 Dr. Elsey’s Cat Attract Cat Litter is great for controlling dust. Litter dust can be a major issue, especially if you think about what it actually is. The only real ways to find out how dusty litter is (since they almost all claim to be dust-free) is to read reviews or try it out yourself. Dr. Elsey’s Cat Attract Cat Litter, rated 90/100, is well-liked for its lack of dust, as are several options from Fresh Step and Tidy Cats. Generic brands are much cheaper, but you may find yourself coughing while scooping and even cleaning your walls, floors and furniture much more often. Let’s face it: Litter boxes are not the most pleasant pieces of furniture in your house. A major concern for both owners and cats is smell. Not only from animal waste but also the smell of the litter itself. Some pet experts recommend to slowly transition new litter in order to allow your feline friend to adjust to the new smells and odor blockers. However, particularly if you live in a small space, odor control can be very important. Look for odor blockers, carbon features and read reviews to see what other people have to say. Most litters will claim to suppress odors but not all litters are made the same. 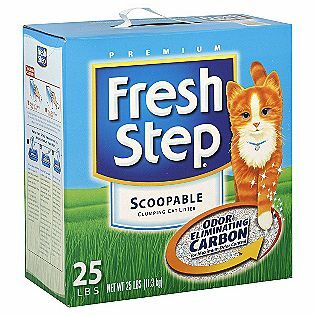 Fresh Step Scoopable Litter with Odor–Eliminating Carbon, rated 98/100, is a Viewpoints favorite for its odor control. Fresh Step is pricier, but reviewers say it’s worth it. There are many different styles of litter which will clump differently. Reviewers say that Fresh Step Scoopable Litter with Odor–Eliminating Carbon is again among the best because of how well it keeps clumps together to help ensure your litter box is clean. Clumping litter also cuts down on scooping time, making your life easier. A good clumping litter will reduce how often you need to change out entire batches of litter and clean the box. Almost all of the top-rated brands on Viewpoints are on the pricier end, but people say they’re willing to pay more to cut down on dust and unwanted odors. The cheaper brands tended to be the lowest-rated types of litter. A little extra out of pocket costs will make your life easier and keep your feline friend happy. Owning a pet is supposed to be enjoyable, and there is nothing enjoyable about inhaling less expensive litter dust while cleaning up litter pieces that have tracked halfway across the floor. Have a favorite cat litter? Review it! Feline Pine!! Been using it for years and I’ve not found anything that works as well as it does. And never, ever any odor. I definitely agree that cheaper is not better when it comes to cat litter! I’ve written a post on my website about finding the best cat litter. It details all the types of cat litter and the options available on the market. A factor you didn’t consider is eco-friendliness. To many people, that is important as well. That is a great point. Eco-friendliness (especially with clay litters) is an important issue, but for whatever reason many of our reviewers did not bring it up, and we really try to highlight the sentiment of our reviewers. Thanks for pointing that out though! Everyone be sure to check out reviews of some of these products on Viewpoints and maybe add your own perspective! Next week we’ll have an interesting article about some cat foods, so stay posted. Thanks! I have 3 cats and we use Kroger grocery store generic brand, a 40lb box of clumping litter for under $9. AND it clumps just as well as fresh step or tidy cats and for only half the cost! IT clumps very very well, so well that i have never seen a cat with a clumpy nasty paw from stepping in the litter. I am very picky about odors and it does just fine in that regard also. I will never go back to the pricey litter again! I use World’s Best (made with corn) or Swheat Scoop (made with wheat). Swheat Scoop has a deal where you can get a free box after buying twelve boxes. I find that these natural litters sometimes don’t clump or fight odor as well as I would like them to, so I simply add a generous amount of baking soda to the litter box. It’s amazing how much better it clumps after adding baking soda! I stopped using clumping litter. It sticks to the cats paws and gets in their water which they drink. This can cause major health problems due to the low Ph. The one exception I have found is Feline Pine. There may be other plant based which are also good. I agree here 100%, Tidy cat is horrible. My apartment stunk to high heaven. I tried it on several occasions, and each time I was sorry I wasted my money. I actually like Cat’s pride. In addition, are you familiar with the Cat Genie “litter disposal system?” I live in a VERY small space and no matter what I tried, I could never completely rid it of litter box odor until I set-up the Cat Genie (a Christmas present) … it INSTANTLY changed everything. I hadn’t realized that the worst of the odor was a result of how I disposed of the clumps; I thought the expensive, stainless steel trash can with a tight lid that I was using was enough but the ammonia in the litter escaped even that. Yesterday morning, I ran out of the Cat Genie bags and need to purchase a refill today – but honestly, within hours of using my old disposal method, the odor had returned. I will be purchasing two refills so I have a back-up for the next time. I run a non-profit cat hospice in my home (actually it’s the cats’ home and they allow me some space). Over the years I’ve tried every litter on the market. I always come back to World’s Best Cat Litter Original (NOT Multi-cat that I think has a bad odor and NOT NOT Lavender that has an even worse odor). It’s lightweight. Doesn’t smell. No dust. It does track but so does every other litter I’ve ever tried. Yes. I’m very picky about keeping the box clean. So every time I go by the box I check it. Yes, WBCL does a great job of clumping. Just stick with the original and don’t get talked into the Multicat. The one drawback is that it is expensive. However, you don’t need to dump out all the litter every couple of weeks. All you have to do is add more litter so it ends up not really being that expensive. Oh, WBCL is corn based so no damage to the cats if they happen to lick it off of their paws. I disagree completely- I love the World’s Best Cat Litter Multi-Cat Lavender scent. It does clump well and I like that it’s a much more natural scent than some mainstream commercial brands. I do not have dust problems with this litter. This litter is also FLUSHABLE, which is a huge deal to me because I can just scoop and flush. It is also totally safe for septic being that it is a corn-based litter. All that being said, my situation is a 2 cat household wherein I take care of the litter box twice daily. They are fed a raw diet so their stool is smaller and has less odor than cats on a cheaper dry or canned diet. Glad it worked for you. My cats would not use the Lavender and I thought the odor of both the Multi-Cat and the Lavender was not nice. I never have odor from the original litter or from the cat’s stools. I clean all of the litter boxes (30) two times a day. Still, WBCL is a wonderful litter. Agree about not having dust. I don’t flush it because of the large number of cats at my cat hospice. I don’t feed raw but do feed grain-free to everyone except those on very special diets. For the lady who wrote about the wheat litter, I didn’t like it because it stuck like glue to the bottom of the litter boxes. Yes! WBCL is really the World’s Best Cat Litter!!! I really like WBCL, but am concerned about things I’ve read about it being carcinogenic to humans and cats. So, I will try the Fresh Step. I had used EverClean before and liked it the best until WBCL, but don’t want to rish getting cancer so I will try the Fresh Step since Everclean was dusty. Maybe I just need a mask when I clean the box. Cleaning the litter box, here are several suggestions. 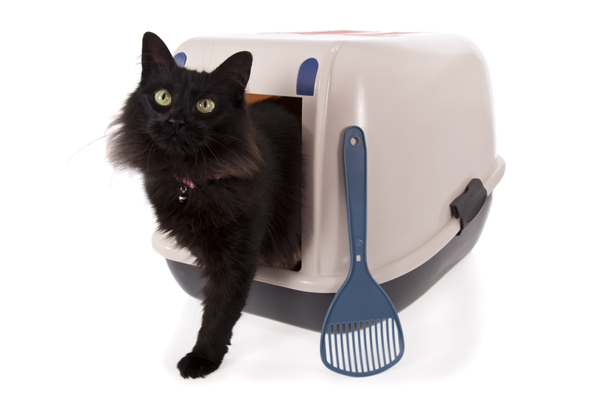 Airborne toxins from a litter box can be a real threat to your health. 1. Wear a breathing face mask when cleaning the litter box. Every time you scoop out the waste; you are also releasing odors and toxins into the air, as you lean over the box, you’re inhaling the fumes, also spray the litter with water prior to cleaning, help keep dust down. 2. Change the litter box outside, and this will help keep odors and toxins outside rather than inside your home. We resolved ongoing odor problems with a product call Air-ReNu. One application and the house will continue, to smell fresh and clean. I always find it funny that animals that seem so particular about certain things can be such a mess sometimes. Good luck keeping your cat in the litter box! Glad you found a product that works! It’s tough to turn down a deal sometimes but then you may get stuck with something you don’t want. I have to switch up brands due to financial issues so I’ve experienced almost all of them. I have four cats and two very large litter boxes (actually, storage bins). I would not recommend any generic brand no matter what brand it’s compared to. Tidy Cats has always been my favorite for odor control, but it doesn’t clump well when they all decide to pee in the same spot before I can clean out. Fresh step is the best for clumping but doesn’t always eliminate the odor right away (does fine in the long run, but two of them don’t bury their poop so there’s about 5 minutes of major stink before the odor control takes over). The hard thing – they use one box for peeing and one for pooping (they are persnickety) and the pee box needs constant attention – so there is no brand that clumps perfectly if I’m gone all day before I can clean the box. We tired a few different cat litters and we always go back to Fresh Step. Not because we like it but my one cat would pee yes pee on my carpet, on our beds and couches. Now we just buy Fresh Step. And we have no pee but in the litter box. Fresh Step does block the the odor. I love the fact it also clumps really good too. We don’t get too many small pieces. But yes my cat is messy and gets litter every where. I think he likes to take a litter bath. i will always use fresh step. they stand behind there product. I like the Arm & Hammer products, especially the Dual Duty variety. My cat’s poop is the stinkiest and this keeps the odor at least manageable. My cat likes it also. Fresh Step is a great product but tends to have a stronger fragrance than I like. It also costs more. NEVER will I try a bargain brand again! The dust was choking me and the cat wouldn’t use her box. We use Fresh Step. It’s the best we have found so far. It blocks the odor and that’s all I care about. It does make a mess when she gets out of the box, But I’ll live with that over odor. I had been using Fresh Step and have recommended to others when they commented on the lack of any cat odor. I tried using Tidy Cat and am so sorry that I changed. I liked the container and bought the 35 pound pail. It stinks, lliterally. It does not clump as well either. I have just finished the pail and am going to fill it with Fresh Step from the 42 pound bargain size that I previously found unmanageable. Yes the more expensive litters are worth it, however the quality of Tidy Cat litter is not as good as it use to be and therefore I have transitioned my cat to Feline Pine which at first was too scented for us but after it sits out for a few days it is good. It is clean and does not track and absolutely no dust. I have found out that it can be scoop able it you scoop out the good pellets to keep and then through out what has turned to dust from urine. I clean the litter box at least daily so this litter takes me a bit longer but my cat isn’t sneezing and neither am I. Tidy cat and Arm and Hammer just aren’t what they use to be and the tracking drove me crazy as well even though the scooping is easier and it lasts longer there is still too much dust. Airborne toxins, can be a real threat to our breathing. The litter box can release harmful toxins. Cleaning the litter box, here are several suggestions. 1. Wear a breathing face mask when cleaning the litter box, every time you scoop out the waste; you are also releasing odors and toxins into the air, as you lean over the box, you’re inhaling the fumes. 2. Change the litter box outside, this will help keep odors and toxins outside rather than inside your home. We resolved ongoing odor problems with a product call Air-ReNu. One application and the house continue to smell fresh and clean.